I created a task list and have connected the list to Outlook. All works well, but is there a way that I can capture more column types from SharePoint into Outlook? By default the title is entered into the "Subject" field in Outlook. Can it function similar to regular Calendar in SharePoint that allows me to show what fields I want to have shown on the calendar (ex. Choice Column...etc.)? When viewing your synced task list in Outlook, click on the 'View' tab in the ribbon and select the 'Add Columns' option in the 'Arrangement' section. 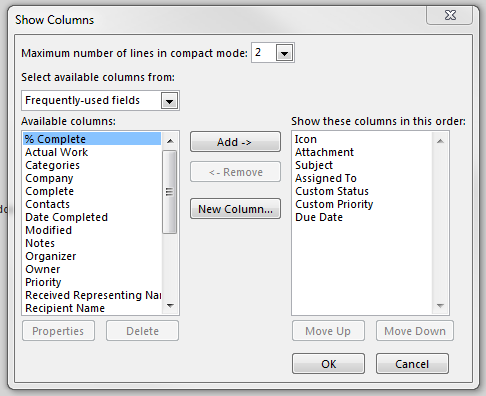 Use the 'Show Columns' modal that displays to add or remove columns from the synced list. Not the answer you're looking for? Browse other questions tagged 2013 sharepoint-server calendar task-list outlook or ask your own question.